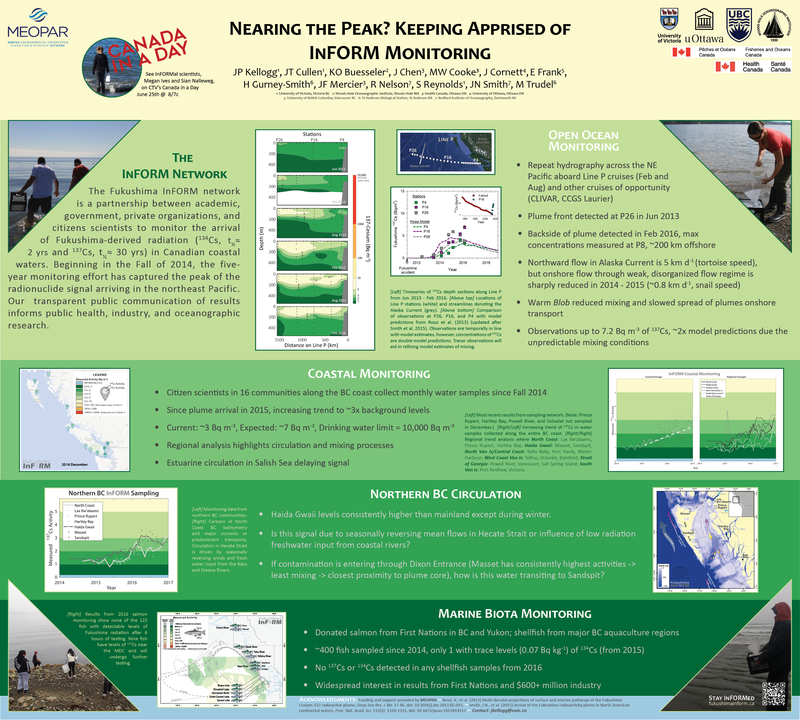 InFORM Program Manager, Dr. Jonathan Kellogg, won best poster at the annual meeting of InFORM funder, the Marine Environmental Observation Prediction and Response network, or MEOPAR. MEOPAR had its Annual Scientific Meeting in Montreal, QC over June 19-22. The meeting is a chance for MEOPAR researchers, whose projects span understanding sea ice thickness and fog formation to potential supply chain risks from shipping disasters affecting fragile infrastructure, to come together and discuss results from the prior year and to hear about plans for the year ahead. About 35 posters were presented by MEOPAR funded undergraduates, graduate students, post-docs, and research assistants during an evening cocktail reception. The reception atmosphere allows attendees to casually mill around the posters in a relaxed manner and to engage with poster presenters to discuss the science for as long as they please. Four MEOPAR scientists served as judges evaluating each poster and presentation against a formal criteria. The winning poster. Click to give it a read. So what makes a good poster, you might ask? The poster is supposed to catch the eye, clearly explain the research being conducted to someone with a differing background, and be presented by the author in a confident, clear, and effective manner. For this poster, Dr. Kellogg used the background he commonly uses on InFORM graphs as a way to designate sections of the poster. Coincidentally, he even matched the poster by wearing a similarly coloured green shirt! Apparently it pays to stay on message :-D.
As a prize, Dr. Kellogg won a MEOPAR prize package that includes a: bag, coffee mug, scarf, leather bound journal, $15 gift card to Starbucks, and $25 gift card to Indigo bookstore.